Penalties, a shock upset and some “cowardly” remarks from the world’s best goalkeeper, there has been little lacking in this year’s Olympic Women’s Soccer Tournament in Brazil. Here are four takeaways from last week’s quarterfinal matches, and what we can look forward to in tomorrow’s semifinals. By now you know that the USA women’s soccer team lost to Sweden in the quarterfinals of the Olympics. By now you’ve also probably heard all the fuss and criticism aimed squarely at US goal keeper Hope Solo for her post-game comments. Unfortunately, Hope’s reaction isn’t out of character for her. This isn’t the first time she’s expressed herself bluntly and rubbed people the wrong way, and it probably won’t be the last. This also exemplifies the type of player she is, a keeper who, in the final PK of the match, tried to ice-out the opponent by walking to the sideline and change her gloves. Solo is about gamesmanship to the nth degree. Yes, she is greatest women’s goalkeeper ever, but when she loses we aren’t really surprised to hear her call the other team “cowards.” And the irony of her statement isn’t so much funny as it is sad. On the other hand, you get to see true class emerge from others when they lose. Becky Sauerbrunn’s tweet after the game epitomizes why she is given the leadership role of co-captain. I've hit the highest highs and lowest lows with USWNT, but what never changes is the honor of representing the USA and love for this team. The same can also be said of Australia's keeper Lydia Williams, who played maybe the best game of her life but did not prevail in an eight-round PK shoot-out against Brazil. After the game she embraced her former Chicago Red Stars teammate, Brazil's Cristiane and later posted her feelings on Instagram. 2. Where did all the goals go? The eight quarterfinalists combined for 48 goals during group play. If you exclude Sweden and China, who only managed 2 goals a piece during their group games, the other six teams averaged 2.44 goals per match. Not too shabby! However, there were only four goals total in the 4 quarterfinal matches including a 0-0 draw in the Australia-Brazil match. What gives? Why did all the goals dry up in the quarterfinals? There are a couple reasons that stick out. 1) The teams were more evenly matched. After being whittled down from 12 to 8 and the weaker teams eliminated, the remaining teams provided for more competitive matches. 2) Teams tend to play more conservatively in the knockout stage, not wanting to make the mistake that sends them home early. It's interesting to note that all the goals came in the second half of play with Sweden opening the scoring in the 61st minute of the USA-Sweden match. Canada scored the game-winner in the 56th minute against France, and Germany scored in the 76th minute against a 10-player China. No team scored during regulation or extra time in the Australia-Brazil match though not from a lack of trying. 3) Fatigue is setting in. All teams had to play three group matches in seven days and then play quarterfinals three days later. With a roster of only 18 players, combined with travel and heat teams are tiring out, particularly in the matches that go to 120 minutes. 3. Love them or hate them, penalty shoot-outs are exciting! We were treated to not one, but two PK shoot-outs in the quarterfinals. Previously, no match in women's Olympics history had ever gone to penalties. Nevertheless, with the game on the line there is no greater pressure for professional soccer players than a penalty shoot-out in a major tournament. Conversely, when you miss, people remember that too. Great players can miss penalties, even the greatest like Lionel Messi in this year's Copa America Centenario final. In the quarterfinals, US forward Alex Morgan had her PK saved by Sweden's Hedvig Lindahl. Same for Brazil's captain, and greatest female footballer ever, Marta who had her penalty saved by Australia's keeper Lydia Williams. In the USA-Sweden match, with both teams tied at 3 spot kicks after the forth round, it was Christen Press' turn to step up. She missed high with the ball sailing above the goal. 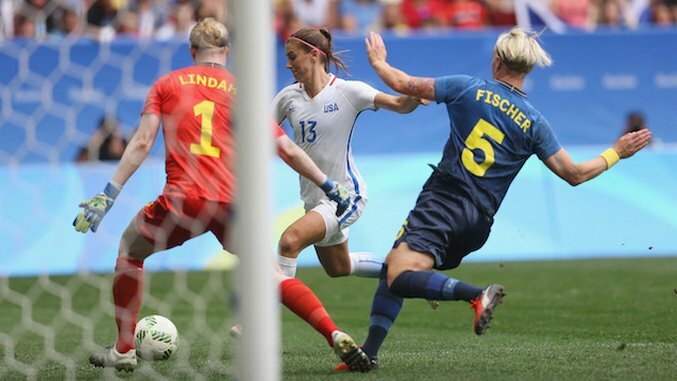 After Hope Solo failed to save Sweden's Lisa Dahlkvist's penalty the US were eliminated. The US will recover. After Carli Lloyd missed her PK in the 2011 World Cup final versus Japan she came back more focused than ever, and we all know how Lloyd's been doing since then. There's a cliché that is all to obvious here: it's not how many times you get knocked down, but how many times you get back up. I would hate to see Press lose her joy for playing and not see her giant, infectious smile on the field in the future. Brazilians had high hopes of their men's team lifting the World Cup trophy two years ago when they hosted the tournament in 2014. Unfortunately, Germany had other plans that included handing Brazil a humiliating 7-1 defeat in the semifinal. This year, many hoped Neymar Jr. could come back to Brazil and lead the men's Olympic team to gold in Rio. But that's not going as planned either. For years—decades, in fact—the women's team struggled to gain the support of their country and countrymen. In many Latin countries, it is still considered unusual for women and girls to play a 'man's sport', to put it mildly. In fact, it was criminal for women to play football in Brazil up until 1979. Luckily for Marta, she was born in 1986. However, even being hailed as the female Pele doesn't guarantee you fortune and fame. Marta's heroics have gone largely unnoticed by her homeland but now the tide has turned. Now fans, and young boys are looking to Marta and company to win a championship on home soil. Playing in front of 50,000 cheering Brazilians, the women's team won in dramatic fashion to advance to the semifinals. And all you have to do is look at the tears and passion on the players' faces to know that this means the world to them. Let's hope this is the beginning of a sea change for women's football in Brazil. Host nation Brazil will be competing against Sweden at the Maracanã in Rio De Janeiro to advance to the final on Friday the 19th. The two countries met in the second match of group play where Brazil easily handled Sweden in a 5-1 victory. Both teams are coming off dramatic penalty kick shoot-outs in the quarterfinals. Sweden upset the defending Olympic and World Cup champions USA in the fifth round of the shoot-out to advance. Meanwhile, Brazil took it to eight rounds after an exhausting, scoreless 120-minute battle with Australia. Brazil won silver medals in the 2004 and 2008 Olympic games, but for the women to make it to the final for a chance to win gold in the Rio Olympics will be unlike anything they have ever experienced. The stakes are no less high for Sweden; if they are able to beat Brazil and advance it would be their first ever trip to the Olympic final. Canada and Germany will square off again 7 days after their group stage match, for a spot in the gold medal game. In their earlier meeting, Canada surprised the Germans 2-1 giving them the top spot in the group. This far into the tournament the Canadians have looked like the strongest team remaining, going 4-0-0. In addition to already having beat second-ranked Germany, Canada has also beaten fifth-ranked Australia in group play and third-ranked France in the quarterfinal this tournament.